This workshop will be conducted by Japanese Kite Master Mikio Toki. 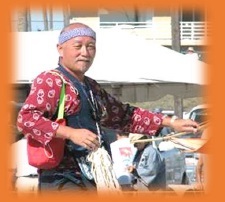 During the lecture, he will introduce the history of kites in Japan, the materials and techniques used to build traditional Japanese kites, and differences in design and shape based on regions. A hands-on workshop will be conducted to introduce Japan and its culture through building of a small, traditional Japanese kite made of bamboo and washi (Japanese paper). Participants will learn how to decorate their kite using a traditional Japanese method using dye, and how to assemble it. Step-by-step instructions will be provided. Children under the age of 12 are welcome to participate in this workshop and lecture, but must be accompanied by an adult. Due to limited space, up to 1 child per paid adult may participate. RSVP by October 14th. Space is limited.